As its name suggests, West Yellowstone, Montana, is best known as gateway to the west entrance of Yellowstone National Park, Come winter, an abundance of snow transforms the region into a postcard-worthy playground, featuring three national forests and two national parks to explore. And the best way to see it all is by snowmobile. You’ll find rugged mountains, open meadows, alpine lakes, and plenty of wildlife easily accessible from the more than 1,000 miles of wintertime trails winding through what is arguably some of the most stunning scenery in the lower 48 states. You’ll find everything from flat, mellow terrain to powdery steeps in the backcountry of the Custer-Gallatin, Beaverhead, and Targhee National Forests, plus lots of options in close by in Yellowstone. With so many choices, where do you start? Here are seven of the local’s favorite trails to explore—although you really can’t go wherever you end up. With Yellowstone National Park right next door, it’s hard to plan a visit to West Yellowstone without stepping into the nation’s first national park. While no car traffic is allowed through the Park’s west entrance in the wintertime, more than 200 miles of groomed trails welcome snowmobilers. Experienced riders can pack up and ride from West to the famed Grand Lower Loop, passing Old Faithful, Yellowstone Lake, Norris Geyser Basin and the Fountain Paint Pots. Daily guided tours to Canyon and Old Faithful are available throughout the season. Tucked just northwest of West Yellowstone, the Madison Arm Loop is where many resident snowmobilers took their first solo rides. Thanks to the flat, winding nature of the trail, it’s a comfortable ride for families or beginners. Twenty miles long, the west edge of the trail meanders along the South Fork of the Madison River (offering stunning scenic views) while the northern edge skirts along the edge of Hebgen Lake (do not ride on the ice along the edge of the lake). Readily accessible from Electric Street in West Yellowstone, the South Plateau Trail offers 13 miles of scenic riding southward, eventually meeting the Black Bear Cutoff (leading to Idaho) or, at 16.2 miles, to the Black Canyon Trail. Feel free to ride off-trail and explore, but don’t cross into Yellowstone National Park—the trail skirts along the western edge of the Park. 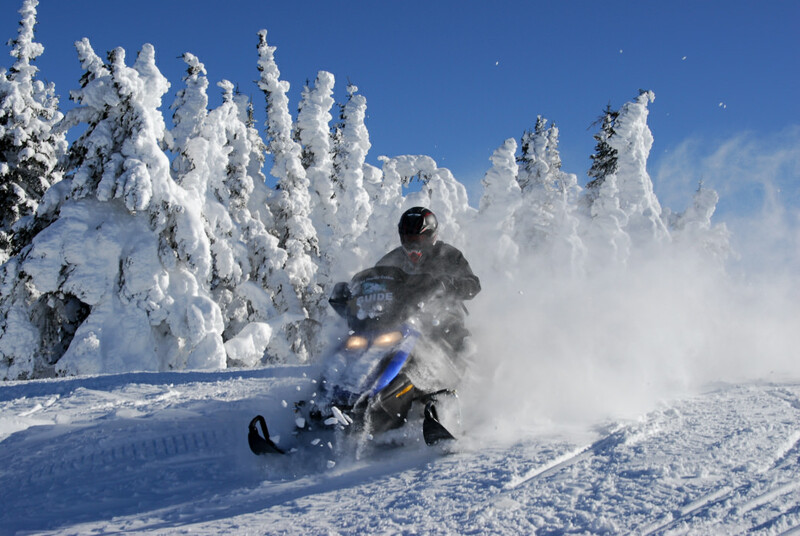 Famed for its “snow ghosts,” Two Top Trail is one of the most storied snowmobiling trails in North America. Pack the camera—thanks to routinely windy conditions, ice crystals are driven onto trees at the top of the mountain, creating eerie snow ghosts that are worth a stop and a photograph. Offering a variety of terrain amidst its 2,000-foot elevation gain, the upper sections of the groomed trail feature remarkable views of local mountain ranges, including Wyoming’s renowned Tetons, Yellowstone National Park and the Centennial Mountains of Idaho. Hebgen Lake is a staple of the West Yellowstone lifestyle, regardless of the season, and in wintertime the lake’s shores are home to a variety of trails. Horse Butte Loop (accessible from the 4.8-mile Horse Butte Trail) travels along the shoreline, winding through thick pine cover before breaking open along the lake. Enjoy off-trail riding along the way, but keep an eye open for restricted areas (denoted by posted signs). Looking for a bit of adrenaline? Lionhead Trail, tracking along the east side of the Continental Divide, climbs for an impressive 10,000 feet over the course of its relatively short 10-mile length. Experienced riders can look forward to steep terrain, impressive snow depth and startlingly beautiful views. Guides are recommended for the Lionhead Trail, as it’s only for experienced riders, who are required to undertake avalanche training. Home to some of Montana’s best backcountry snowmobiling, the Big Sky Trail’s 110-mile route begins just north of West Yellowstone. Riders can enjoy a few miles of groomed trails before the pathway changes into a world of ungroomed powder. Enjoy impressive hill-climbing opportunities, deep fields brimming with snow and the wild, rugged scenery typical of southwestern Montana. Best for experienced, aggressive riders looking for an authentic backcountry experience, the Big Sky Trail is one of the region’s most well-known wintertime trails. 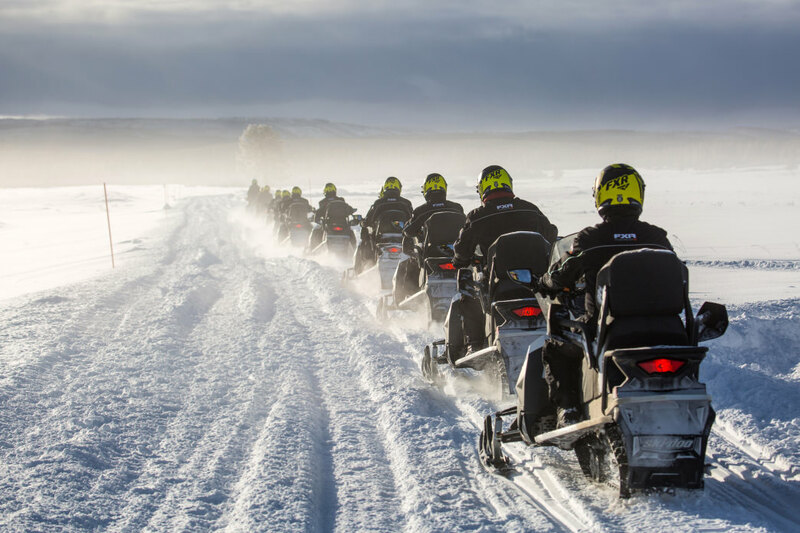 In addition to spectacular trails, visitors to West Yellowstone will find the area’s snowmobiling community is like a family, welcoming visiting riders warmly. While the town is filled with places to rest, dine, and relax before the next day’s adventures. Winter brings a certain stillness to the Yellowstone region, with the impressive snowfall chasing away many of summer’s tourists and creating an uniquely intimate experience. 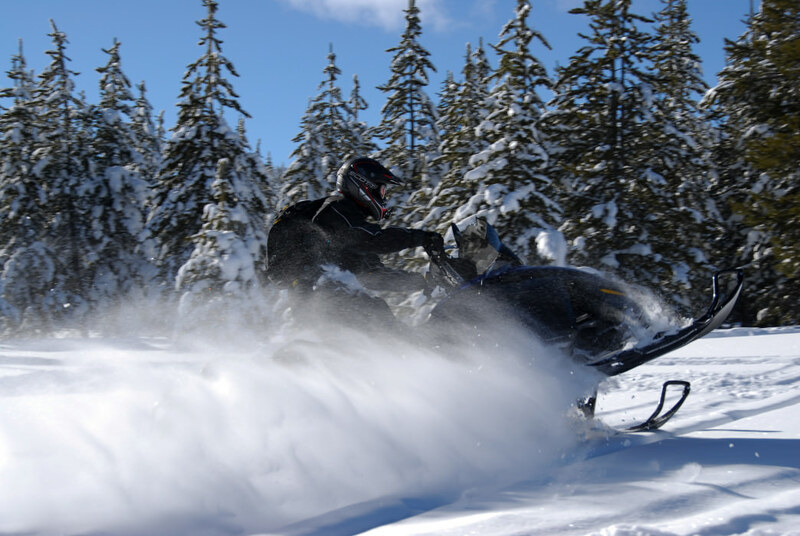 Regardless of riding level, there’s adventure to be had on a snowmobile.